With the outrage of World Wide Web, it is safe to say that websites are our new library. From e-commerce, education, entertainment to promotional and information-based, we come across so many websites every day. But do you know who writes each and every page of the books we call websites? Yes, the web developers! A website is essentially built by web developers who write the source code to build a website. Go to any website and press Ctrl+U (for Windows) or Cmd+U (for Mac) to see what’s called the source code of a website. In addition to fluency in these languages, front-end developer needs to be familiar with frameworks like Bootstrap and AngularJS which ensure great-looking content no matter the device, and libraries like jQuery and LESS, which package code into a more useful, time-saving form. Connecting the server to database and server to the website is the work of back-end developers. Back-end developers are less concerned with design and more focused on security and server performance. They make sure all the moving pieces are working together smoothly behind the scenes. For this, they use PHP, Ruby, Python, and other server-side languages. A full-stack developer is a person who performs both front-end and back-end development. a. HTML – HTML is an acronym which stands for Hyper Text Markup Language. Hyper Text is a text that has a link to it. Every time when you click on a word which brings you to a new webpage, you have clicked on a hypertext. A markup language is a programming language that is used to make the text more interactive and dynamic with images, tables, links etc. HTML is used to format and organise the content into headings, paragraphs, lists and other content areas so that they can be displayed by browsers and other user agents. It also allows us to link to other documents, embed external content such as YouTube videos, display images, etc. One can build a simple site with nothing but HTML. If you want to be ready to build yours, check out W3School HTML and Khan Academy HTML online courses. b. CSS – CSS is an acronym which stands for Cascading Style Sheets. It is a style sheet language which is used to describe the look and formatting of a document written in markup language. It’s generally used with HTML to change the style of web pages and user interfaces. It allows a developer to decide and define how a web page or a website will eventually look or appear to the visitors. Some of the elements which CSS has an impact on include font size, font style, the overall layout, the colors, and other design elements. Learn this fascinating style sheet language using W3School CSS and Codecademy CSS. e. PHP – PHP is an open source language and fast prototyping language. It is an interpreted script language which means that it is usually processed by an interpreter. For this reason, the language is most suitable for server-side programming that has server tasks being repeatedly performed when the website development process is on. If you wish to learn PHP online, use PHP Manual and javatpoint to get started. f. Python – The design of the language is such that it supports code readability which means that its syntax is such that only a few lines of codes are needed to express a point or a concept. This is a high-level or advanced language that is considered easy for beginners to understand and learn. Some of the best online resources to learn Python are Learn Python and Internshala’s Python Training. g. SQL – Database management is a necessary skill required for overlooking various aspects. SQL is a universal database query language used to interact with databases, which are a part of every backend web application. No matter what language or framework you choose to build your website, you are likely to use SQL, or some abstraction of it, to interact with the database. You can start learning SQL using W3School SQL and Vertablo Academy SQL courses. 2. Design sense – The look and layout is a crucial part of a website. A web developer needs to know some design principles. The knowledge of layout principles, typography, responsiveness, and image usage will turn you into a more successful and valuable web developer. 3. Empathy – Keeping yourself in user’s shoe and building a responsive, content-focused, well-crafted, accessible, and valuable website with simple and interactive UI should be the aim of every developer. Empathy for the users will change the way you design your website and improve UI/UX for the user. 4. Responsiveness – A web developer should ensure that the web pages work properly on different devices. Irrespective of the device being used – cell phone, tab, or laptop – the website should function smoothly and without any glitches. 5. Testing – Web Testing in simple terms is checking your web application for potential bugs before it’s made live. There is a long and necessary list of testings that needs to be done before you launch your website. 6. Analytical skills – Understanding the users and their experience with the website requires a lot of analysis. There are plenty of tools out there that can help you with the web analysis and turn it into an easy-to-understand report that gives you much-needed insight into your unique web visitors. 7. Communication – Good people skills are crucial. The needs of designers, developers, clients, and customers have to be perfectly aligned in order to create a good website. This means that communication is a big part of every web developer’s job and should be treated with a high sense of priority. 1. Google’s developer training is one of the most useful web designing courses available for students. 2. Internshala’s Online Web Development Training – For learning web development from the scratch including HTML, CSS, Bootstrap, PHP, and MySQL – you’ll finish it by learning how to make your own e-commerce website. 3. When you find yourself stuck with a problem, use Stack Overflow and seek help from other programmers out there. 4. You can also find great snippets on Codepad if you’re looking for HTML/CSS solutions to common problems. 1. Build your own website –The best way to learn website design is to come up with ideas and build a website around it. For example, if you are a foodie, make a website for food reviews! And I’ve already introduced you to web development courses, learn how to create a website and make one on your own! 2. Do an internship – You will get a chance to work on making websites that would be used by thousands of people. Not to forget the contacts and practical lessons you would gain! 3. Practice – The best way to master web development is to practice. You can use sites like CodeChef, Hacker Noon, HackerEarth to participate in various coding contests and sharpen your programming skills. 4. Participate in a hackathon – There are many reasons why hackathons are a must for a programmer. Hackathons are a great place to try your hands on new projects and compete with other web developers. 5. Do freelance projects – Once you gain some confidence on your skills, take up some interesting projects. Freelancer and Project4hire offer some amazing projects that you can work on. 6. Contribute to an open source project – Open source refers to a computer program in which the source code is available to the general public for use and modification. Open-source code is meant for programmers to improve upon the source code and share the changes within the community. You can try some of these open source projects. 7. Put your code on GitHub – GitHub is an essential platform for every web developer which allows them to save code online and lets others see what changes you have made. You can also discuss the issues with your code with other developers. 8. Stay updated – Keep yourself updated about the new features, trends, and methods by following blogs like Tutorialzine, DeveloperDrive, and Tuts+. 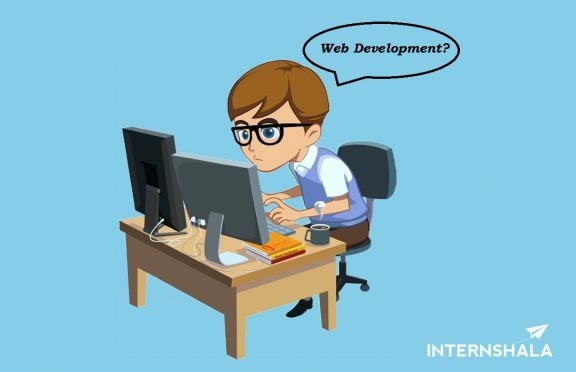 Web development is a huge industry with ever-growing career opportunities. With India evolving into a startup hub, it has become one of the most sought-after skills. Even on Internshala, we have around 645 Web Development internships active every month. Lit up the flame of your desire to be a web developer and apply to Web Development internships today to give your career a kick start. Really very informative article for all computer science engineering students and also those who are interested in the field of web development. it’s very nice article .i want to be a web developer .Will you help me ? it’s very nice article. i want to be a web developer .Will you help me ? it’s really a good article about web development and web designing. This post is awesome and very informative. This website will really help everyone in providing the tools and information necessary for the people to develop and improve their website. Thanks! This is by far the best post that I have come across which clearly explains the details of skill set that one needs to learn to become a web developer. Good work. Appreciate your efforts in compiling and sharing this. Thank you! Interesting post and so informative. I love how you explain things so honestly and the content is so detailed. Thanks a lot for sharing such amazing post! Surely a lot of web devs will find this helpful!